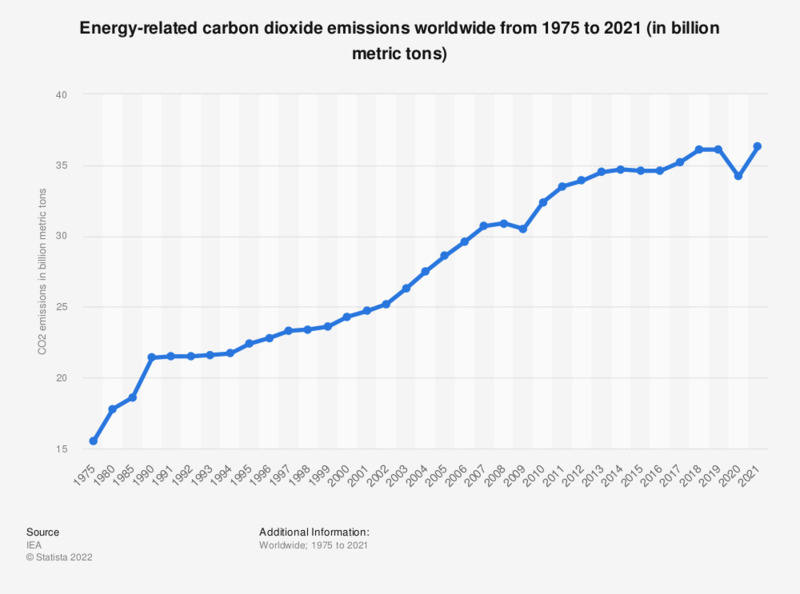 The statistic represents global energy-related carbon dioxide emissions between 1975 and 2018. Globally, 17.78 gigatonnes of carbon dioxide was emitted in relation to energy in 1980. In 2014 and 2015, there were two consecutive years of greenhouse gas emissions decoupling from economic growth, as emission levels stayed stable despite GDP growth. In 2015, carbon dioxide emissions from fuel combustion totaled some 32.3 billion metric tons. The volume of global energy-related carbon dioxide emissions has steadily risen over the last few decades, from 15.54 gigatonnes in 1975 to 33.1 gigatonnes in 2018. However, the rate of increase has slowed down in the last few years, but has still reached a historic high in 2017. Since 2013, there has been evidence of a global decoupling of greenhouse gas emissions from economic growth. It has been suggested that the immense addition of new renewable energy capacity has been critical for reducing emissions growth. In the recent past, a decrease or relatively unchanged volume of emissions has only been seen during economically weak periods, such as during the 2009 recession. Both the United States and China, two of the largest emitters in the world, registered a decrease in carbon dioxide emissions in 2015. In China, a reduction in coal consumption has enabled an economic restructuring towards less energy-intensive industries and an emphasis on renewable resources. However, the decrease in emissions from these two countries was largely offset by other developing Asian countries and the Middle East, as well as increased emissions in Europe. Carbon dioxide emissions worldwide were primarily emitted by the Asia Pacific region, which reported more emissions in 2017 than North America (6.12 billion metric tons) and Europe and Eurasia (6.37 billion metric tons) combined.